Venomoth in game: 454 Who? Important notice! Pokemon Venomoth is a fictional character of humans. 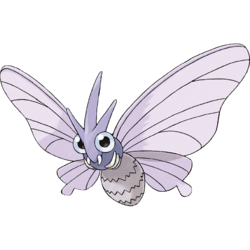 Venomoth (Japanese: モルフォン Morphon) is a dual-type Bug/Poison Pokémon introduced in Generation I. It evolves from Venonat starting at level 31. 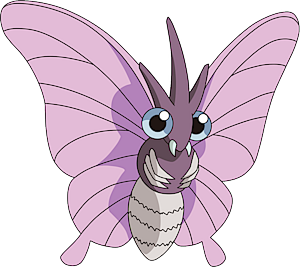 Venomoth is an insectoid creature with a light purple body. It has bulbous, round eyes with large pupils and a small mandible. Its thorax is paler with several black, zigzagging stripes running across the horizontal length. It has six short legs and a three-point crest on its head. Its two pairs of wings are covered in dust-like, purple scales that vary in color depending on their toxic capability. Dark scales are poisonous, while lighter scales can cause paralysis. These scales are released when Venomoth flutters its wings. Venomoth live in dense forests with much undergrowth and little light. As a nocturnal Pokémon, Venomoth comes out at night to hunt of its favorite prey. It prefers to feed on insects that gather around light, and Venomoth is attracted to bright lights itself. Koga's Venonat evolved into Venomoth in The Ninja Poké-Showdown. Chaz used a Venomoth in the Rustboro City Pokémon Contest in All Things Bright and Beautifly!. In Shocks and Bonds, Katie battled against Ash using a Venomoth in the Ever Grande Conference. Venomoth's Disable attack caused Ash's Torkoal to be unable to use Iron Defense, so that her Golduck could knock out the Coal Pokémon with Hydro Pump. In the following episode, Katie's Venomoth used Disable once again to prohibit Ash's Swellow from using Peck. It was eventually defeated by Swellow though. At the beginning of Mewtwo Strikes Back, a pirate Trainer by the name of Raymond used a Venomoth to battle alongside his Golem and Pinsir. Raymond's Golem, Pinsir and Venomoth fought Ash's Pikachu and were defeated afterwards. 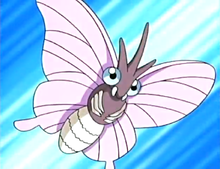 Venomoth also appeared in The Kangaskhan Kid. A Venomoth appeared in Round One - Begin! under the ownership of a Pokémon Trainer competing in the Indigo Plateau Conference. A Trainer named Assunta used one to battle Ritchie in Friends to the End. A Venomoth had a small cameo in Tracey Gets Bugged as one of the Bug Pokémon on Murcott Island. 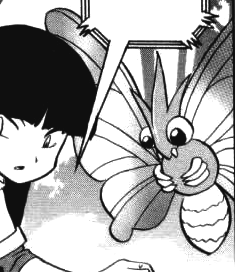 A Venomoth belonging to Rudy made a cameo appearance in Misty Meets Her Match. Multiple Venomoth also appeared in The Power of One. A Venomoth was seen in a fantasy in The Rivalry Revival. 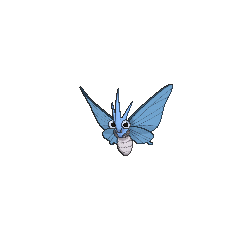 A Venomoth appeared in Illusion Confusion! as an illusion compose by Haunter and Gengar. In The Bug Stops Here, Jessie dressed as a Venomoth in order to attract Bug types, however this did not work as she scared a real Venomoth away, causing it to use Stun Spore. A Venomoth also appeared in Celebi: Voice of the Forest. Multiple Venomoth appeared in the opening of Destiny Deoxys. A Venomoth appeared in the opening of Lucario and the Mystery of Mew. A Venomoth appeared in The Ole' Berate and Switch! as used by one of the Team Rocket Grunts. A Venomoth appeared in Staging a Heroes' Welcome! under the ownership of a Pokémon Coordinator competing in the Wallace Cup. A Venomoth made a cameo in Arceus and the Jewel of Life. A Venomoth appeared on the picture in the gallery museum in A Blustery Santalune Gym Battle!. EP032 Venomoth Ash's Pokédex Venomoth, an evolved form of Venonat. Tiny scales on its wings disperse various spores when they are flapped. Venomoth debuts in The Secret of Kangaskhan in the Red, Green & Blue chapter where Blue defeats a wild one but doesn't catch it because he already has one. This was the first Pokémon to be shown with a Pokédex entry. Another wild one appears in Wake Up—You’re Snorlax! when Red partakes in the bike race held in Route 11. In Valiant Venomoth! in the Yellow chapter, Sabrina also has a Venomoth. It was used in a battle against Lorelei. A Venomoth appeared in Skirting Around Surskit I as a rental Pokémon that Guile Hideout stole. In Interrupting Ivysaur, a Venomoth under the ownership of a Veteran named Beck appeared during Platinum's challenge at the Battle Arcade. Tomio caught a Venomoth but released it as it was a Practice Zone for catching Pokémon. Pokémon Adventures PS003 The dust-like scales covering its wings are color coded to indicate the kinds of poison it has. It has a short life span, and appears to be the evolved form of a Venonat. The dust-like scales covering its wings are color coded to indicate the kinds of poison it has. The powdery scales on its wings are hard to remove. They also contain poison that leaks out on contact. The powder on its wings is poisonous. It scatters the powder with every flap, so you may be poisoned if you are downwind. When it attacks, it flaps its large wings violently to scatter its poisonous powder all around. The powder on its wings is poisonous if it is dark in color. If it is light, it causes paralysis. Venomoth is nocturnal - it is a Pokémon that only becomes active at night. Its favorite prey are small insects that gather around streetlights, attracted by the light in the darkness. Venomoth are nocturnal — they only are active at night. Their favorite prey are insects that gather around streetlights, attracted by the light in the darkness. The wings are covered with dustlike scales. Every time it flaps its wings, it looses highly toxic dust. The dustlike scales covering its wings are color-coded to indicate the kinds of poison it has. It flutters its wings to scatter dustlike scales. The scales leach toxins if they contact skin. The powder on its wings is poisonous if it is dark in hue. If it is light in hue, it causes paralysis. Moves marked with a superscript game abbreviation can only be bred onto Venomoth in that game. 51%-100% HP I'll dump venomous powder on foes with every flap of my wings! 26%-50% HP My health is half gone. Level up Yes! I leveled! My toxins powered up, too! 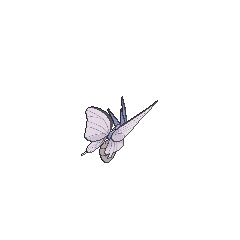 For other sprites and images, please see Venomoth images on the Bulbagarden Archives. 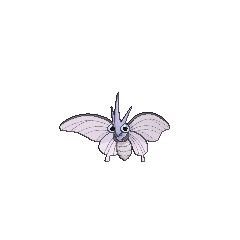 In early official art of Venomoth, it was shown having yellow spots on the back of its wings. This was removed when later official artwork was released. Venomoth shares its category name with Dustox. They are both known as the Poison Moth Pokémon. Venomoth's ability to poison its enemies and its type combination suggests that it may have been based on a moth in the Arctiidae family. 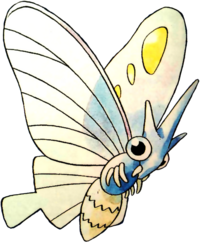 Its Japanese name may mean it may also have been influenced by the Morphinae subfamily of butterflies; its wings's design seems to be heavily influenced by Morphinads. Venomoth is likely a combination of venom and moth. Morphon may refer to the butterfly genus, Morpho.